Place oven rack in the middle of the oven and preheat oven to 350 degrees. Line the bottom of a 13×9 baking pan with parchment paper and spray lightly with cooking spray. Using a standing mixer fixed with the paddle attachment, mix the cocoa powder, flour, sugar, baking powder and baking soda. Add the oil and mix to combine. The batter will be thick. Add the eggs, one at a time, mixing until well integrated. Add the hot water, 1/2 cup at a time. Make sure to scrape down the sides of the bowl as needed. Pour the batter into the prepared baking pan. Bake at 350 degrees for 12 minutes or until a toothpick inserted in the middle comes out clean. Let the cake cool in the pan. When cool, invert onto a cookie sheet lined with waxed paper. (This is easier to do than it sounds. Just place the cookie sheet over the pan and give it a flip.) Place in the refrigerator until chilled. Cut the cake rounds using a large biscuit cutter (dipped in flour). 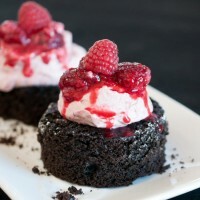 Top the cake rounds with a scoop of the Raspberry Mousse and refrigerate until ready to serve. Just before serving, add a couple reserved raspberries to each cake round and then drizzle with the Drunken Raspberry Sauce. Place a metal or glass bowl in the freezer to chill. In a small bowl, sprinkle the gelatin over 2 tablespoons cool water and let stand until dissolved. While the jam cools, whip the cream in the chilled bowl (now retrieved from the freezer) until stiff peaks form. Gently fold in the cooled jam mixture. Place cleaned raspberries in a bowl. Toss with sugar until well coated. Add the Chambord and gently mix. Allow to sit at room temperature, gently stirring occasionally.